The H-9500 is a 100-300 kV TEM with LaB6 electron gun. This is a user-friendly workhorse for atmoic-resolution TEM imaging and routine structural characterization. The excellent imaging capability also makes the H-9500 a platform for in-situ TEM. Various Hitachi in-situ heating TEM specimen holders enable the imaging of dynamic structural changes at elevated temperatures. A special version for gas environmental in-situ TEM is available. 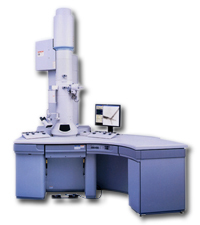 The H-9500 300 kV transmission electron microscope is designed to support research on solid state materials and polymeric materials. The H-9500 300 kV TEM utilizes modern computer control and digital cameras to enhance user-friendliness. The H-9500 is known for its ease of atomic resolution imaging, high sample throughput and a wide variety of analytical capabilities.